The designers have cleverly repurposed 30 galvanised steel street bins, commonly used on housing estates and filled them with 3m high fruit trees and meadow flowers to create a contemporary, orchard. Design workshop, Jail, has built modern benches from galvanised steel and green oak, which link with some of the bins, so you can sit and enjoy the scenery. It’s amazing how such a simple idea can transform an ugly concrete walkway. It’s not only the planting which attracts the attention, the bins have quotes from Octavia Hill, printed on the outside, like this one:”Beauty is for all: beauty is the single glimpse of green, in sunlight however dimmed, in clouds however darkened, in faces however worn.” raising awareness of the social reformer and her ideas. They also have the words “Adopt me” printed on them as London housing estates can apply to adopt them when the festival ends. Four housing estates will be chosen and will be twinned with National Trust properties so they can receive training from their gardeners. Octavia’s Orchard, which is part of the Festival of Neighbourhood, is on the Festival Terrace on Royal Festival Hall’s Level 2 Terrace until 8th September. An interview with the talented muralist, painter and photographer Faye Chadburn. 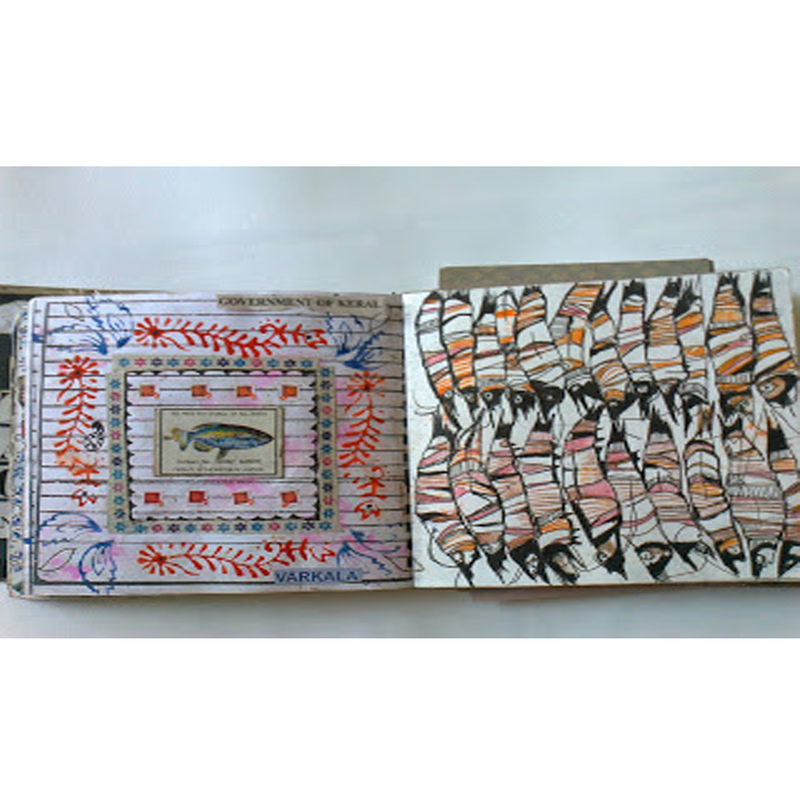 I’m suffering from wanderlust at the moment and whilst researching my next trip, I stumbled across Faye Chadburn’s blog, http://fayesuzannah.blogspot.co.uk and loved her Indian sketchbook and photography. Her sketches evoke memories of my own trips to India, the heady mix of colours, architecture, textiles, people, flora and fauna. As a talented illustrator she has captured something of the essence of the country. Read the interview below to find out more about Faye’s work and her two month trip to India. What took you to India? Throughout 2012 I had been assisting a very good artist friend, Diana Milstein, to design and produce a series of screen-printed and stitched wall hangings that she had been inspired to create after a trip to India in 2011. So all these images of India were floating around in my head and Di is certain that is why I ended up booking a ticket. I justified leaving my dog for two months as I was loosely involved in a project to paint a public mural in Birmingham to promote the planned Museum of World Religions. I’m not a religious person but the idea to try and depict religion with a single image was an exciting challenge and where better to research the imagery of religion than India. Where did two month trip take you? We travelled from Mumbai down to the southernmost tip of India and back up again. It wasn’t all sightseeing but we spent time in Mumbai, Kochin, and Bangalore, in the hill tops of Ooty and the rural areas of Mysore, Bykaluppe and Hampi as well as many hours on public bus rountes that rattled up and down endless mountains and stopped in many industrial towns. Did you have a favourite place? The best place undoubtedly was Gokarna in Karnataka State which houses a handful of temples and receives hundreds of Hindu pilgrims on a daily basis. This location offered the perfect balance of religious imagery, which I had come to see and the peace, quiet and comfort of a shack under palm trees where I could sit and draw and collect my ideas after time in town. Your sketches reveal the people, the architecture, wildlife and religious imagery. What inspired you the most on your trip? The elegance of the ladies, in beautiful, clean, crisp saris with highlights of gold jewellery. Faye’s series of photographs entitled Double Dreams. Each photograph contains two, sometimes three images. For me, they capture the visual feast that is India. I love the collage like effect and the way the images draw you in to investigate the interplay of images. How did you create such beautiful photographs? I use the in-camera multiple exposure analogue method, using an old fashioned camera. Multiple exposure means that each image contains several pictures all overlapped in a random way. This occurs when the 35mm analogue roll film is shot right through 24 or 36 shots and then wound back to the beginning without loosing the end of the film and then starting again on top. The camera decides where the frames start and finish. It’s not a new technique, some cameras have a multiple exposure button, which allows the photographer to shoot something and then press it to instantly be able to shoot over the top. This is too controlled for me. I like my camera to do the work so it is important to have a good machine. At the moment I have a Pentax K1000 camera that I inherited from my late father. He was a devoted Buddhist and part of my trip was also in his memory. I am certain he would be both surprised and proud of the miles his camera has travelled with me. Have you incorporated any Indian influences into your murals since you returned to the UK? Most of my murals are commission based and people tend to have a definite idea of what they want which is an interesting challenge for me as a designer but doesn’t enable me to include my own influences as much. I am however painting some canvases based on my India trip. A sneak preview below of the peacock painting that Faye is currently working on. I would love to paint bigger murals and in more public places here in the UK and further afield. I’m also interested in collaborating with others. Sadly my dog doesn’t understand the difference between Keith Haring and Maria Rivans otherwise we would be great together! I’m also investing more in my photography and hope to get a group of other multiple exposure photographers together to exhibit in Brighton or Bristol. To see Faye’s murals, a slide show of her sketchbook and more of her photography go to www.fayesuzannah.co.uk. This week our lust list has certainly been inspired by the improving weather – our mitts want hold of African inspired busy prints in dusty pinks with pops of satisfyingly zingy lemon yellow! Thanks for the mention guys.